Since Seven Seas Games exists now, I hopefully won't need to do any more work on this ;) , so I thought I'd share some of it just for fun. I was working on A Certain Scientific Railgun deckbuilding game as a personal project (for obvious reasons I couldn't sell this or anything). I love the series and really wanted a game based on it, but nothing gets localized here, so I decided to make something inspired by what my friends and I play during our tabletop nights. My primary inspiration was Legendary since I thought it most appropriate to be a cooperative game. My main goals were to make it cooperative, allow you to choose a specific character to play, and make it expandable for a wide number of players since our groups fluctuates often. I'm not showing everything here, but I had a fully playable version. It was very rough though, since it was my first draft, and we had to adapt and take notes as we went. These cards are mostly from my second draft, which was never fully finished. Aside from a lot of numbers and effects which were to be tweaked, there's already a lot I'd do differently. Between having seen more of the franchise and a recent game of Dominion with my grandmother (that gave me an interesting perspective from someone who's not dumb, but entirely new to the concept), there's more to reconsider, but I still thought this would be fun to share. 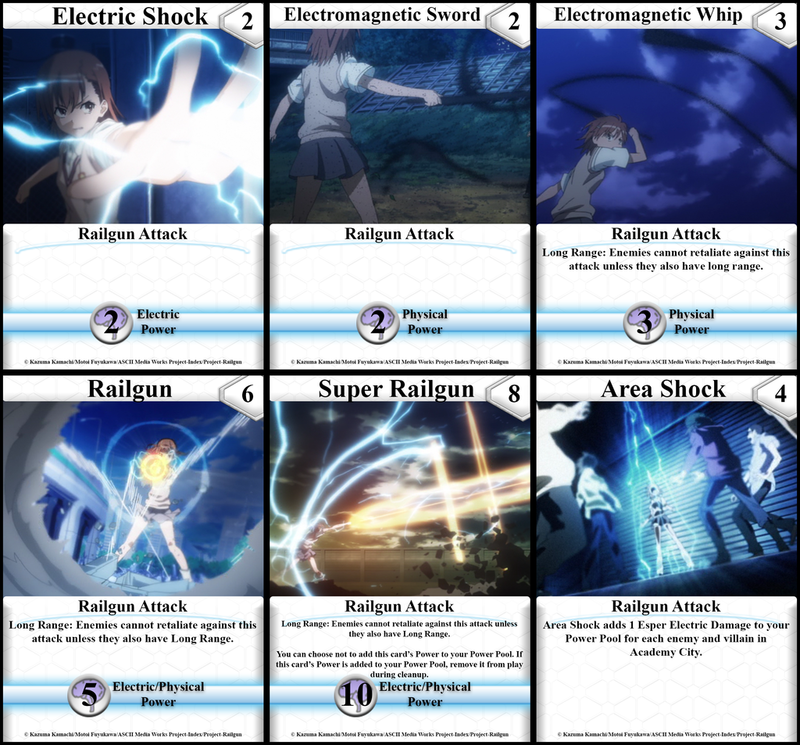 Keep in mind I had only seen the first season of the Railgun anime at the time. I was aware of more of the franchise, so Magic and such exists in the rules, but I always imagined that as an expansion onto this. 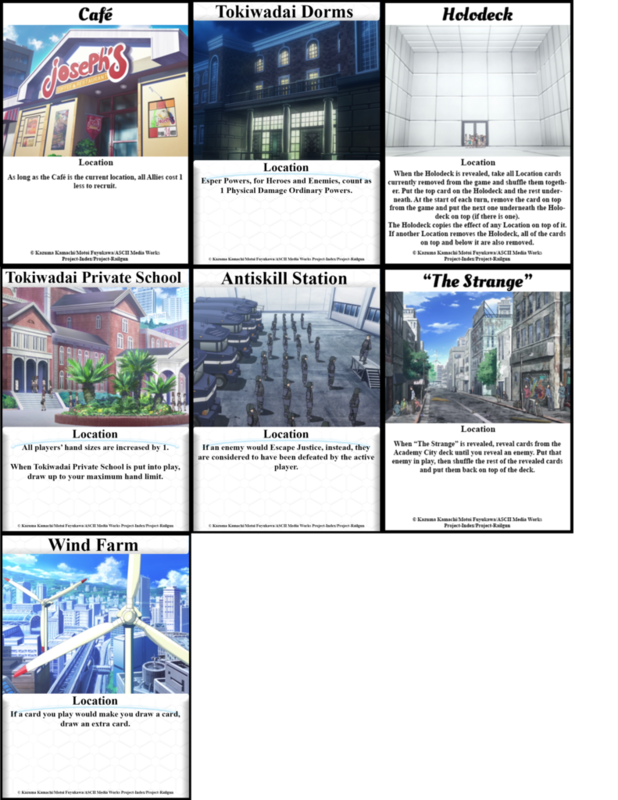 The funny thing is, after watching Index, I think having a more early Railgun inspired base game that's primarily everyday Academy City with the conspiracies and stuff of Index as expansions really does work from the perspective of the setting. 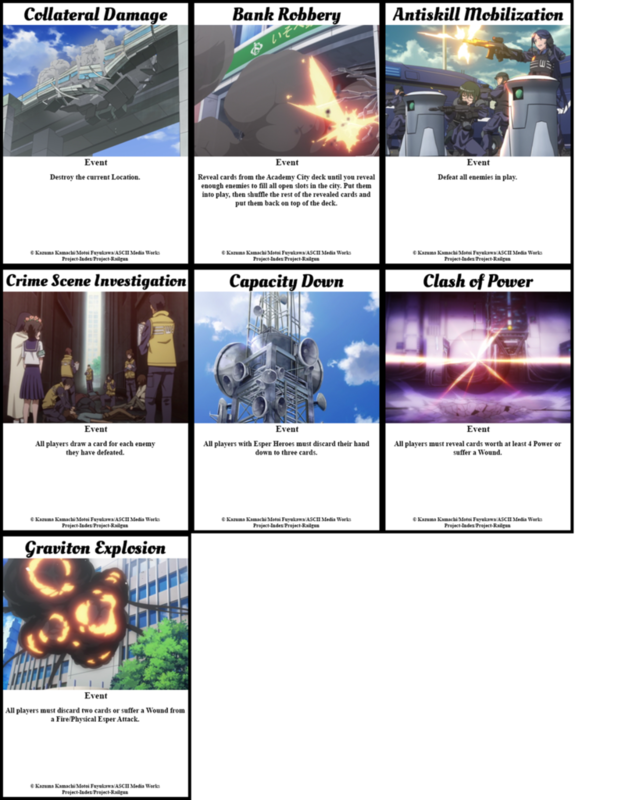 First season anime Railgun spoilers in the cards. I love games that play a bit different for each player, and I like being able to pick your favorite character. Aiho was not playable in the first draft, but was added to the second as an in-joke due to one of my friends buying up all but one of the Aiho ally cards in the first draft. Plus, I wanted more than four heroes to expand the game anyway (and didn't know enough about Index at the time to draw from there). I was never really happy with the role the heroes played in the game though. As you can see, the effects vary pretty widely here. 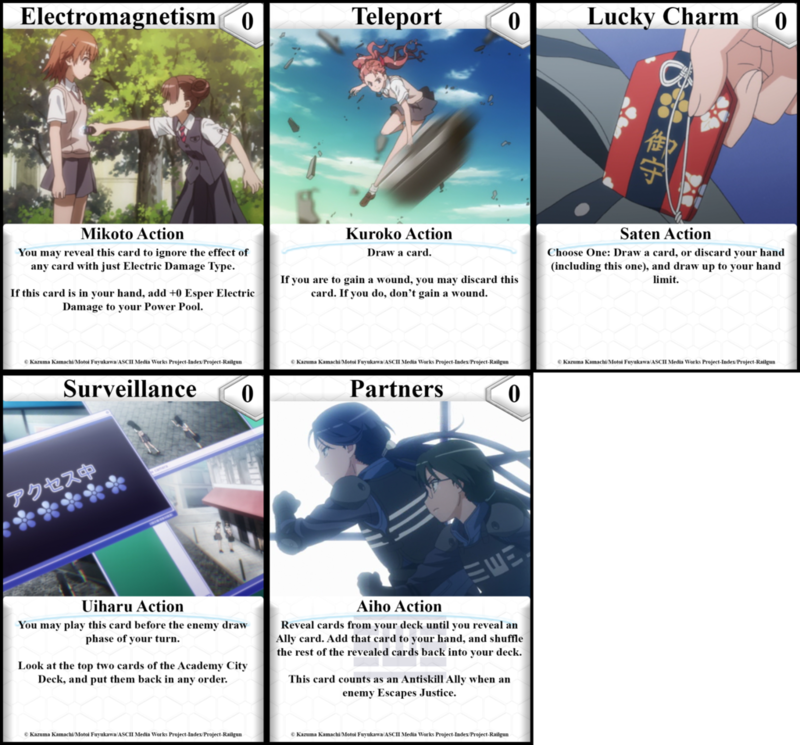 Normally I'm not fond of screencap card games, since most companies seem to use it as an excuse to be lazy on the art, but since it was my only option to make it look decent, I tried my best to pick good compositions. Considering I had recently watched the show at the time, it was pretty easy for me to remember where to go looking for scenes I might want to draw from. The hero (and villain) cards were the exception, which I wanted to be full art, but the aspect ratio of the show made that pretty much impossible to look good on the proportions of a card. I was not really happy with the way these turned out visually, but they were fine placeholders for what I was using them for. I took the multi-stage villain concept of Legendary and expanded it based on the different "forms" villains would progress through. 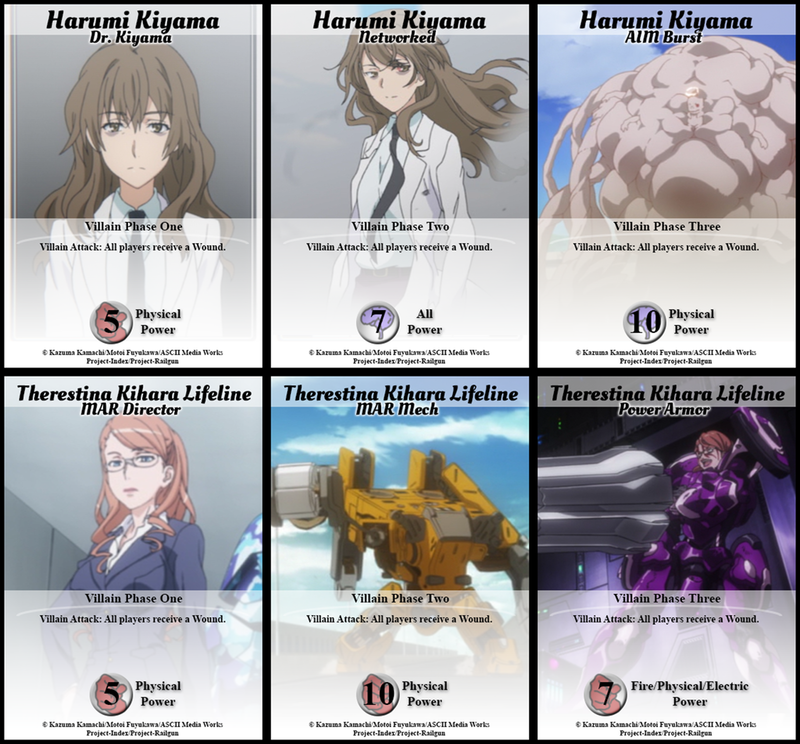 After seeing Railgun S and both Index seasons, this would probably be harder to expand for the future, but I really liked it for these characters and prefer it to the less flavorful variations in the base Legendary. The effects were all the same in this draft, but that's because I was trying to focus on getting all of the combat balanced and seeing where it might be best for the villains to affect you before I started throwing around crazy effects. 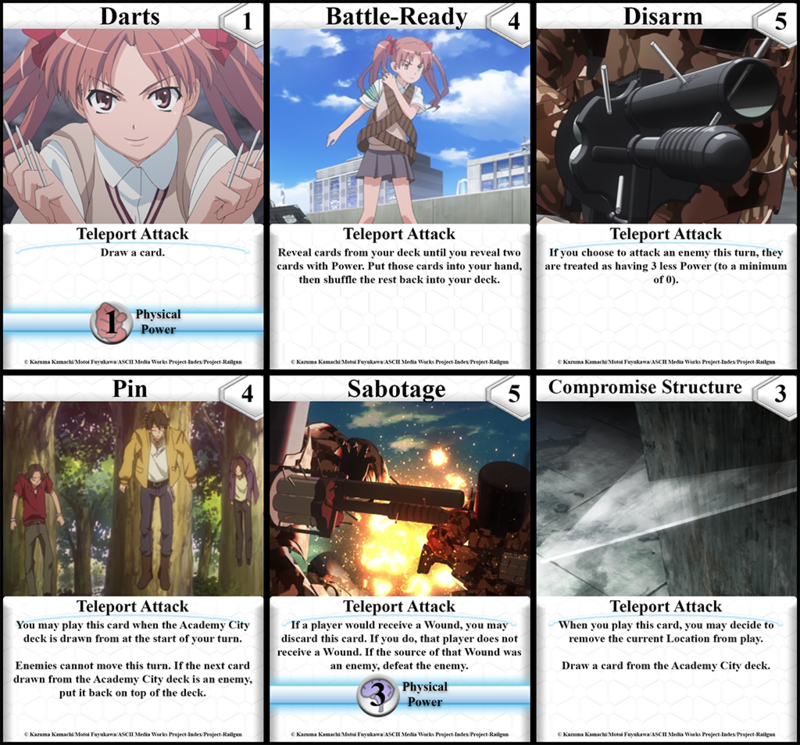 (Also, the AIM Burst isn't intended to literally be Kiyama, but the card is named for her as a gameplay mechanic to denote the villain its encounter is a phase for.) Like the heroes, I wanted more impressive art for these, but I think these at least look more intended to be the way they are in their current state. These were new for the second draft. Another attempt to help distinguish the heroes was that they would start with special cards in their decks. I'm still not sure what was best for this, but I like some of these concepts anyway. Mikoto used to have the first ability on Electromagnetism as her hero ability, but it just didn't work out. The damage types as a whole are something I only introduced so I could have her resist electricity-based things, but it's a mostly irrelevant feature that I'd probably end up dropping in the long run for the sake of the larger game. A lot of features such as power origin (ordinary, esper, magic), power type, esper level, and watermarks were primarily there as future-proofing for mechanics I might want to add later than fully fleshed out elements in these drafts. Making character specific cards was an early idea, but a very awkward one. Some characters are a lot easier to design cards for. In many card games, this is handled by making access to the cards universal even if they're themed. Something like that is probably best, but I wanted to give more themed characters a chance. I wanted to showcase these abilities at least. 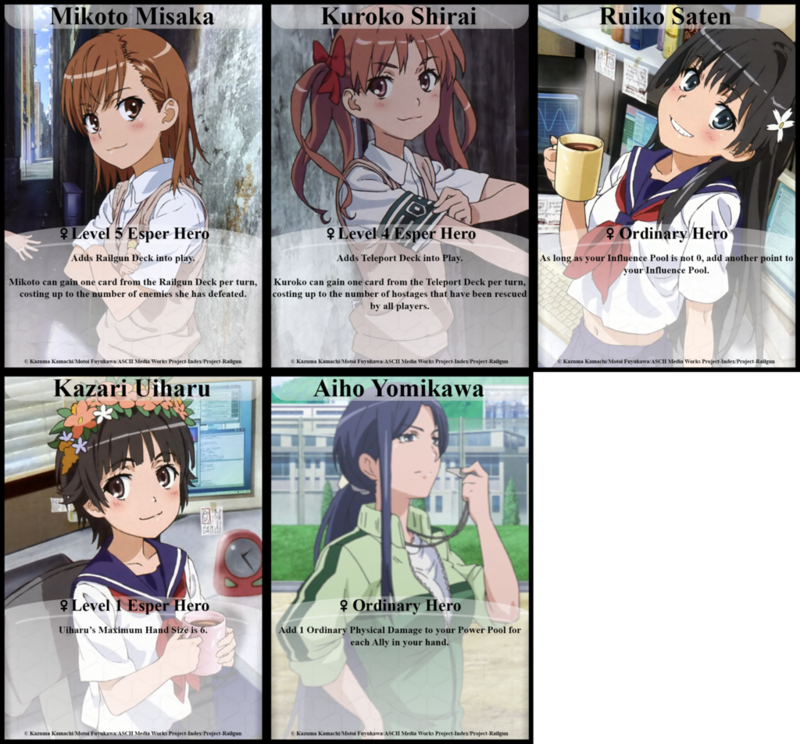 Kuroko was a bit harder to design cards for, but not as impossibly as Uiharu and Saten. I think I got some good variety here. 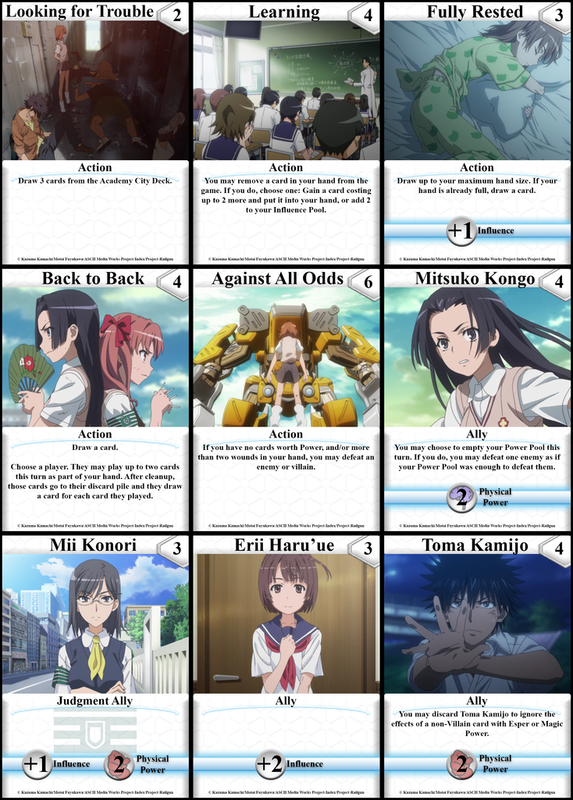 Uiharu and Saten had some really forced cards in the first draft. The only ones that survived are now in the starting cards, though I really wanted to find a place to put Saten's baseball bat attack back in. The concept of Events was something I added because I love games that add that little extra bit of flavored randomness. These would have been in the enemy deck and occasionally throw something unexpected at you while adding a bit of narrative. These survived intact from the first draft, as you can tell from their lesser detail. In fact, Bank Robbery actually influenced a major rules change about combat between the first two drafts. It might have been simpler to just change Bank Robbery, but the old mechanic really did feel overly restrictive and not fun. Locations are something I really wanted to have because they add a fun bit of setting to a game for me. As you might be able to tell, I like when a game really builds a narrative (not that I don't like games where you come up with it from scratch, and you still have to balance it with gameplay). Some of these remained intact from the first draft. These were some of the cards that were part of a more Dominion-like permanent pool to buy from. Personally, I think Legendary's randomized hero pool makes the game a bit too random sometimes, and wanted to have something to balance that back out. In the first draft, these were much more elaborate, but I realized that one of the best parts of Dominion is how streamlined and straightforward most cards are. Having to read several situational paragraphs on so many cards at once is just asking for players to forget effect triggers, if they even understood it to begin with. That's it for now. There's a lot of missing context in the cards I showed, but I hope what's here is still fun to look at.